When we moved into our house 10 years ago, the family room was hardly furnished. We had a TV, couch, a couple of chairs, Paul's desk and some bookshelves that were only about half full. Since the room spans the entire length of the house, it felt huge and empty. Now it's crammed full. We've added a piano, a full drum set, an elliptical and a rowing machine, a coffee table and three end tables and the bookshelves are crammed so full we're stacking books on top of books in places. When we moved in, the storage room in the basement held our Christmas decorations and a few random other things. Now it's so full it's a serious chore to try to find something in there. Much of it probably needs to be donated or sold, but we just don't have the time/energy to deal with sorting it all out. I have joked that people should be forced to move every few years so they have to regularly declutter and get rid of all the excess that builds up. This accumulation of stuff is obviously not a new problem. In Matthew 19 there is a story of a young man who came to Jesus to ask what he needed to do to have eternal life. Jesus told him, “If you want to be perfect, go and sell all your possessions and give the money to the poor, and you will have treasure in heaven. Then come, follow me.” (vv. 18-21, NLT). The young man's response is recorded in verse 22, which I think may be the saddest verse in the whole Bible: "But when the young man heard this, he went away sad, for he had many possessions." Isn't that sad? This young man let his possessions, his stuff get in the way of his eternal life. But how would we react if told to sell all of our stuff in order to follow Jesus? Would we immediately set up a yard sale and get rid of it all? Or would we be like the young man in the story, walking away dejected because we couldn't bear the thought of being without our stuff? I will be the first to admit that I like my stuff. I like our book collection, my quilts and fabrics, my sewing machine, our board games, my phone and laptop. I even like the stuff that isn't directly mine. I can't play music at all, but I love that we have a piano for Paul to play and drums and guitars for Aiden. I have a hard time imagining life without the stuff we have accumulated. Matthew 6:19-21 says, "Don’t store up treasures here on earth, where moths eat them and rust destroys them, and where thieves break in and steal. Store your treasures in heaven, where moths and rust cannot destroy, and thieves do not break in and steal. Wherever your treasure is, there the desires of your heart will also be." Obviously, the young man's possessions had captured his heart. Have mine? Have yours? 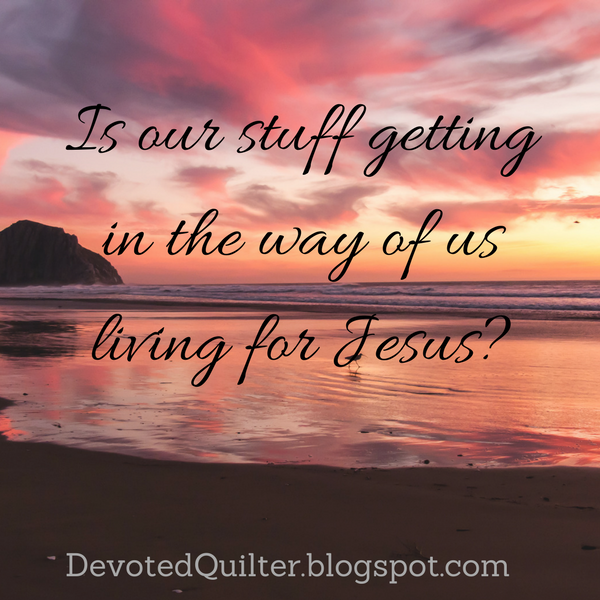 Is our stuff getting in the way of living as Jesus would have us live? Is our focus more on things than on impacting people for eternity? It's not that we shouldn't own anything. That's impractical. As with so many things, it's a matter of our heart. What do we value most? What is our treasure? If it is the stuff of this world, then we have opted to treasure things that will decay and be destroyed. But if our treasure is found in serving God and others, then it is treasure that will last for all eternity. Good reminder. I'd hard to find the right balance between enough stuff and too much stuff. Thoughtful post... We moved 18 years ago to this house... a bigger house with an unfinished basement and 3 younger kids. Now all are grown. 1 permanently out of the house. 1 soon to be. Every inch is full. I am trying to purge but trying not to refill. When I purge I try to give it to places that need it or can sell for their work. It is hard. Then there is all the stuff that we inherit! Emotional ties. I wonder what I would say to Jesus. Thanks again for the weekly posts. Wise words. We come into this world with nothing and leave with nothing. Our stuff should not be our focus in life, but it is difficult to life without our stuff. We need to be mindful of where our heart lies. Thank you for this post Leanne!